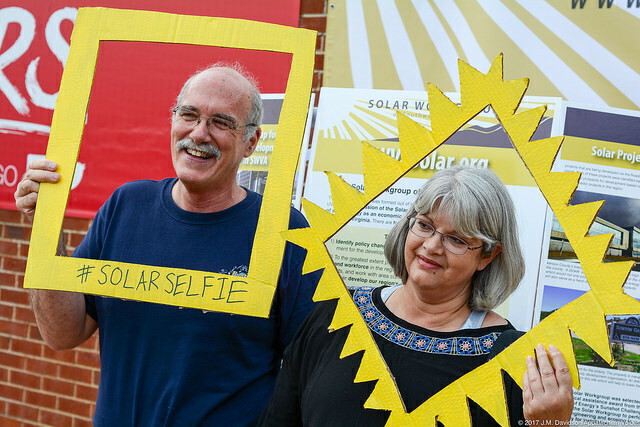 The Empty Bottle String Band’s rendition of “You Are My Sunshine” filled the football stadium at the University of Virginia-Wise in Norton, Va., last week as residents congregated to celebrate solar development and economic transition in Southwest Virginia. 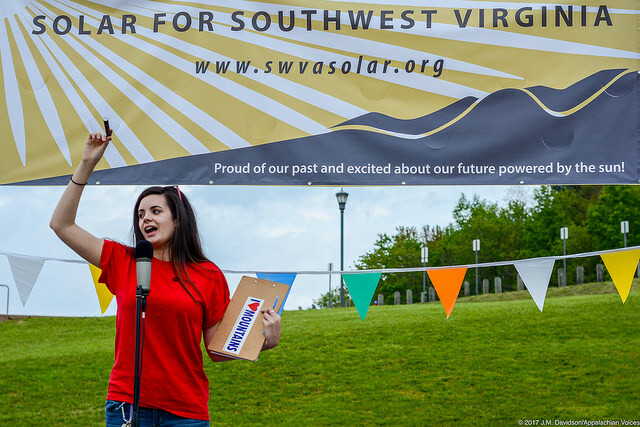 Appalachian Voices was proud to co-host the 2017 Solar Fair along with our partners in the Solar Workgroup of Southwest Virginia. The event showed enthusiastic community support and engagement for an industry that holds economic promise for local communities. Our goal was to introduce more people to the many benefits of going solar — from creating jobs and community wealth to saving energy and protecting our environment. Exhibitors from groups such as eNRG, Energizing Renewable Growth and Mountain Alliance for Community Economic Development came to share information about solar. Clinch River Valley Initiative did a “trash to treasure” craft activity. The Wise County Cooperative Extension was there to help folks make do-it-yourself solar ovens from recycled pizza boxes. And regional solar businesses Aries Clean Energy, Ecological Energy Systems, and Sigora Solar were out demonstrating their equipment and answering customer questions. 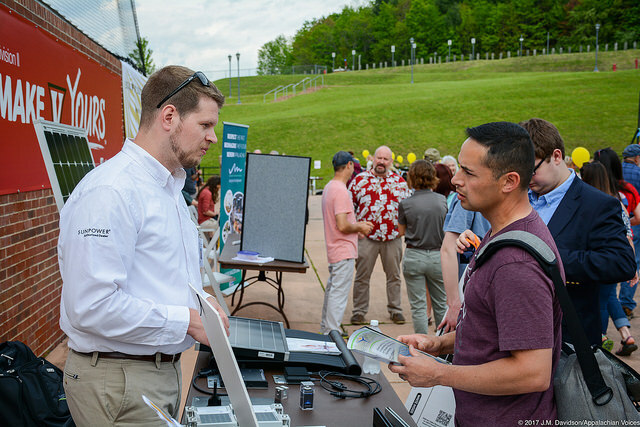 Blake Southerland of Ecological Energy Systems in Bristol (l) and Lorenzo Rodriguez of Big Stone Gap talk about opportunities in the solar industry. Attendees munched on local asparagus cooked in the solar stove and fresh popcorn powered by “SPARC-E,” a mobile solar trailer built and designed by Mountain Empire Community College students. The trailer contains enough batteries to store solar power from the 5,000 watts of solar panels affixed to the outside of the trailer. SPARC-E also powered the sound stage and the inflatable. 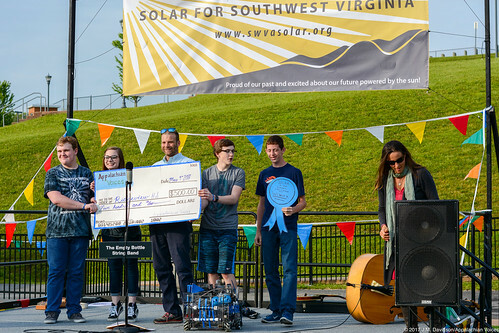 At the end of the fair, Appalachian Voices awarded $500 each to two local high school teams who developed Solar in Your School project proposals. The Eastside High School Ecology Club from Coeburn, Va., submitted a plan to build a solar phone charger and received approval for installation from their school board. Ridgeview High School’s robotics team from Clintwood, Va., plans to create a solar powered robot to help educate their peers and community about solar energy. Lydia Graves, with Appalachian Voices, at the 2017 Solar Fair in Southwest Virginia. The Solar Fair and the 2017 Southwest Virginia Economic Forum at UVa-Wise the following day served as an opportunity to showcase the progress made on more sizable projects in Southwest Virginia. The Solar Workgroup formed as a result of last year’s UVa-Wise economic forum, made up of nonprofit and community action agencies, colleges, state agencies, planning district commissions and other interested citizens and businesses. 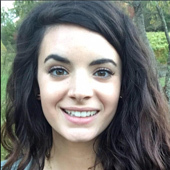 The workgroup was recently awarded a $10,000 grant from the U.S. Department of Energy to provide technical assistance for development of a handbook for actionable steps toward solar economic development in far Southwest Virgina. Many thanks to all who attended, our speakers, and special thanks to UVa-Wise, our many volunteers, Coeburn’s Boy Scout Troop 301 for their help setting up and all who made the Solar Fair a big success.